Halifax completed a Championship Easter double with a hard fought, tense 16-14 home win over Oldham at the Shay. Richard Marshall’s side looked to have their near neighbours under lock and key when they led 14-0 with half an hour remaining. But late tries from centre Kieran Gill and prop Joe Burke, the latter converted by Scott Leatherbarrow, hauled the Roughyeds back into contention at 14-10 with 12 minutes left to play. Halifax centre Steve Tyrer kicked a penalty to give his side a 16-10 lead, but there was drama when winger Jamal Chisholm touched down in the corner, Leatherbarrow’s crucial conversion attempt drifting wide. And inside the last 30 seconds, the Roughyeds had a chance to win the game, winger Adam Clay heading for the corner, with only an outstanding cover tackle from Tyrer, Will Sharp and Ben Johnston saving the day. The home side had taken the lead on nine minutes when captain Scott Murrell kicked long, found the base of the post and his half back partner Johnston followed up to claim the try. Tyrer kicked the conversion and should have been lining up a second attempt after 24 minutes, bursting clear from Johnston’s pass, only to give Oldham full back Scott Turner the chance to punch the ball from his grasp on the try line. That was it as far as clear scoring chances went for both sides, although Fax looked the most threatening when the ball went right, where recalled centre James Woodburn-Hall and in-form winger James Saltonstall looked capable of finding space. The home side also turned down a straightforward kickable penalty five minutes before the break, opting to run the ball but coming up empty handed as the sides headed to the dressing rooms at 6-0. 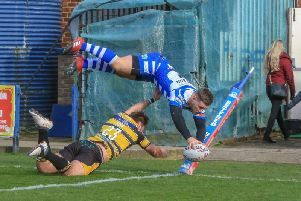 Halifax stretched their lead early in the second half, Tyrer kicking a penalty before winger James Saltonstall danced over, Tyrer converting, to make it 14-0 and set the stage for an unexpected grandstand finish.